Every brewer wants to make good beer or wine. There are many ways to achieve this but there is one thing you have to do and that is to sanitize your beer brewing equipment. If you don't, you run the real risk of infected beer which turns out to be undrinkable. And where's the fun in that? So using so-called 'no rinse' brewing sanitzers is an excellent way to keep your beer free of unwanted microorganisms in your beer or wine. So what is a 'no rinse' brewing sanitizer? It's a solution that once you have sanitized your brewing equipment and beer bottles, you do not need to rinse off. In contrast, if you've used caustic soda or bleach, you will need to rinse your equipment and that just takes precious time that not many brewers have. I have read that some people consider bleach a no-rinse sanitizer but I think it can leave a smell behind which most people would want to remove by rinsing so we can discount it as an option. So 'no rinse' sanitizer it is then. So what are the best ones to use? Are they all the same or do some do a better job than others? There's a couple of schools on how to go about choosing the nest brewing sanitizer. You can go with commercially oriented solutions like Star San and my personal favourite, home-based options from your laundry like sodium percarbonate. Let's start with Star San as it is a well-known option within the brewing and wine making communities for cleaning and sanitizing brewing equipment. This proven bug killer that will lay waste to all the microorganisms that could screw up your beer. It is described by its maker as being a "self-foaming acid sanitizer ideal for brewing, dairy and other food and beverage equipment." The key ingredients of it are a mix of phosphoric acid and dodecylbenzenesulfonic acid. We say it is a very effective bactericide and fungicide! So about this no rinsing business? It can be used without rinsing under the proper concentrations. This means following the amount per litre instructions! 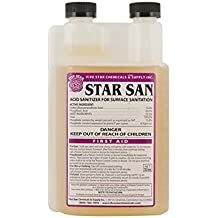 Star San should be used at a ratio of one ounce to 5 gallons of water. This means Star San is perfect for sanitizing your empty beer bottles or the carboy. The beauty of Star San is that it can be used both for the 'spray on' method or for soaking equipment and beer bottles in a tub or bath. It is probably the most well known and well recommended sanitizing product known for home brewers. Check out the price on Amazon. Iodophor is very popular one rinse sanitiser used by many a home brewer. Iodophor is well established in the food and beverage industry as a go-to sanitizer and it works just fine on your brewing gear. The key active ingredient is iodine, an element that's been found to be wonderfully good at killing germs and preventing contamination. It's so good, hospitals and doctors use it during surgery to keep the human body free of bugs. Home users often use it with cotton buds for simple first aid hygiene. So you know it's safe to use on your children, it will work pretty well on your beer kit! It doesn't work well as a spray solution - it's best to soak your gear with Idophor for at least 10 minutes to sanitize your equipment properly. When it is used at the recommended concentration level with water, it is a no rinse brewing solution. While Idophor is odourless, tasteless, and easy on your hands it's very colour fast and will stain your clothes so be careful when mixing up your solution! Why don't you One-Step into my office? With One Step powdered wash you can lean your beer and wine making equipment quickly and easily with this non-toxic, oxygen-based cleaner. Your mixing directions are to use 1 tablespoon with your water and wait 2 minutes of contact time (so it's a bit faster working than iodine based sanitizers). Once your gear has been soaked long enough, it is ready to use. The main ingredient of One Step is sodium carbonate peroxyhydrate aka sodium percarbonate. How it works is quite clever. The powder obviously dissolves when combined with water, which in turn releases the oxygen from the carbonate to form hydrogen peroxide – a chemical which is well known for its sanitizing and disinfectant abilities. And that's a point we should make - this product is marketed mainly as a cleaner, however the hydrogen peroxide does double duty as a sanitizer. 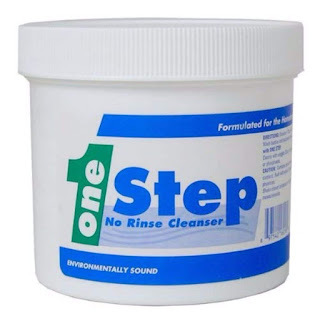 This product a one step, no rinse because once hydrogen peroxide completes its work and it breaks down simply into oxygen and water which is safe as houses. Check out the price on Amazon. Go and have a look in your laundry right now. Did you find a laundry soaker? Some Oxi-Clean, Tide or Napisan or any other Oxi-named cleaner perhaps? If you did, chances are you've got a cleaner that does double duty as a sanitizer in the form of sodium hydroxide. We've have raved and raved for years about how good sodium percarbonate is as a sanitizer. If it's safe enough to use on your clothes, it's safe enough to use on your beer gear. If you are a bit nervous about using a laundry powder, you can buy sodium percarbonate in a pure powdered form quite cheaply and easily on Amazon. So there you have it, a few suggestions on some easy to use, cost effective no rinse sanitizers for brewing. There are plenty of other options out there - you can use other cleaners like PBW to the same effect. Whichever way you choose to sanitizer your beer, do it well, do it properly and just do it. If you don't, you will genuinely increase the odds of getting an infected beer, and frankly, if you've had it happen to you, you'll know what a stink and unpleasant experience that is! Many brewers are trying out Craftmeister's Alkaline Brewery Wash as they consider it performs quite well.